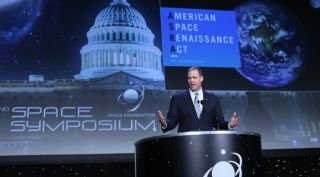 U.S. Rep. Jim Bridenstine (R-Okla.), President Donald Trump's nominee to lead NASA, speaking at the 32nd Space Symposium in 2016. The United States Senate is holding a hearing today (Nov. 1) about the nomination of Jim Bridenstine to be the next NASA Administrator, and you can watch it live. Bridenstine will testify before the Senate Committee on Commerce, Science, and Transportation, beginning at 10 a.m. EDT (1400 GMT) today. You can watch it live here at Space.com, courtesy of NASA TV. But some people have raised concerns, citing Bridenstine's lack of a scientific background and past statements questioning the reality of human-caused climate change. For example, last week, Sen. Patty Murray, D-Wash., sent a three-page letter to Sens. John Thune, R-S.D., and Bill Nelson, D-Fla. — the chairman and ranking member of the commerce committee, respectively — voicing her opposition to Bridenstine's nomination. "Rep. Bridenstine's background makes him an extremely concerning choice to lead this critical agency and its 19,000 diverse employees," Murray wrote in the letter. "Rep. Bridenstine's denial of climate science and consistent opposition to equal rights for women, immigrants, and gay, lesbian, bisexual, transgender, and queer (LGBTQ) individuals should disqualify him from consideration." If Bridenstine is confirmed, he will succeed Robert Lightfoot, who has been serving as acting NASA Administrator since the beginning of the Trump administration. Lightfoot took over from NASA chief Charlie Bolden, a former space shuttle commander who was nominated by Barack Obama. Bridenstine isn't the only person testifying today. The hearing also covers the nominations of three people to non-NASA posts: Dana Baiocco, to be a commissioner of the Consumer Product Safety Commission; Neil Jacobs to be an assistant secretary of Commerce, Environmental Observation and Prediction; and Nazakhtar Nikakhtar, to be an assistant secretary of Commerce, Industry and Analysis.